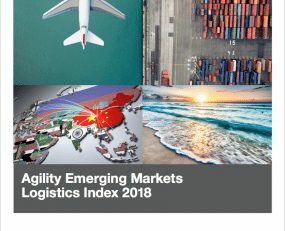 That is according to the Agility Emerging Markets Logistics Index 2018, compiled by Transport Intelligence in partnership with Agility. Apart from the prediction of stronger emerging markets growth in 2018, this year’s survey has generated plenty of other interesting findings. For example, survey respondents believe that small and medium-size businesses are going to be the biggest beneficiaries of emerging markets growth. 56% say SMEs operating in emerging markets will grow faster than large companies; while just 26.2% say the reverse. It also appears that India’s Goods & Services Tax unification and other economic reforms have been greeted favourably by the logistics industry. The percentage of professionals who said their companies are now considering investment in India jumped from 22.8% a year ago to 37.4% in the latest survey. And on Brexit, few in the logistics industry see reason to worry the UK’s departure from the European Union will damage emerging market economies, even though Brexit will force the UK to negotiate its own trade agreements with non-EU countries. Nearly 45% of executives say emerging markets will be unaffected, while just 25.4% said emerging markets stand to gain from Brexit. The survey also indicates that India and China remain, by far, the leading investment destinations for the logistics industry. Vietnam leads a second group that includes UAE, Brazil and Indonesia. Among the countries drawing increased interest from the industry are South Africa, Malaysia, Turkey, Philippines, Thailand, Myanmar, Kenya, Egypt and Bangladesh. Conversely, countries attracting less investment interest from the logistics industry include Brazil, Russia, Saudi Arabia, Mexico and Nigeria. As for the Index, among the largest emerging markets, the so-called BRICs countries, China and India topped the Index again and put more distance between themselves and No. 3 UAE. But the biggest movers were Russia (up three spots to No. 7) and Brazil (falling two places to No. 9). This largely reflects economic stabilisation in Russia and Brazil’s ongoing economic and political difficulties. The biggest mover by Index score was Egypt. It surged six places to rank No. 14. Like Russia, this reflects something of a return to normalcy as it secured IMF loans by agreeing to float its currency and cut subsidies. Africa’s largest economy, Nigeria, tumbled seven spots to No. 31 as low oil prices, extremist violence, corruption and political uncertainty dragged it down. Unsurprisingly, Venezuela fell 15 spots to rank dead last out of 50 countries in the Market Size and Growth sub-index ranking, as its economy imploded. According to the Index’s survey results, logistics executives were split on whether an updated agreement would help Mexico (24.3%); hurt Mexico (21.8%); or leave trade broadly unchanged (25.7%). This division is possibly due to the uncertainty of the outcome, though it may also be due to respondents being unsure about the impact of proposed changes to NAFTA’s rules of origin chapter (also see page 47 of the Index). Overall, there appears to be a sense of cautious optimism around emerging markets.